Looking for a Tasty and Unique burger to grill up this summer? 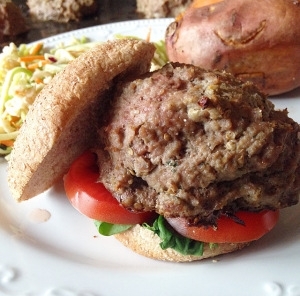 Make these incredibly moist and flavorful Baba Ghanoush Burgers! They are super simple to make and are sure to be a crowd-pleaser! Place slices of eggplant on a cooking sheet sprayed with cooking spray. Drizzle a little olive oil over each slice. Bake for 30 minutes. Let cool. In a food processor, combine all ingredients excluding ground turkey. Blend until well combined. Place ground turkey in a large bowl and add baba ganoush. Mix together until well combined and form into patties. Bake for 35 minutes, or until burgers are done.